Un beau cottage Carolina niché dans le club Currituck, Serendipity est un refuge familial parfait pouvant accueillir 12 personnes. Il se trouve sur un terrain calme et boisé, à quelques minutes à pied, à vélo ou en tramway de l’accès à la plage. Vous pourrez profiter des rockers sur le porche ou dans le confort de la grande véranda arrière avec moustiquaires océaniques et sonores, qui surplombe une grande piscine de 16 'x 32'. Le porche a des meubles et balançoire. Demi-salle de bain, buanderie, cuisine, garde-manger, grande chambre avec télévision à écran plat / DVD et coin repas avec une table pleine grandeur (8 personnes) et accès à une véranda. Espace bar avec mini frigo. Suite King Master avec télévision à écran plat et salle de bains avec baignoire à jets, douche et double vasque. Prenez 3 petites marches pour accéder à une autre suite King Master au-dessus de la zone de jeu, avec télévision et salle de bain avec douche. Coin salon mezzanine avec lit de repos et balcon privé. Pyramid Bunk with Trundle dispose d'un accès au pont et partage une salle de bains avec une chambre lit king-size dotée d'une télévision à écran plat et d'un balcon privé. Chambre Queen avec TV a accès au couloir salle de bain avec douche. La zone de jeu dispose d'une grande télévision à écran plat et d'une chaîne stéréo. Les installations extérieures comprennent une piscine privée, un bain à remous pour 6 personnes, une douche extérieure, une terrasse meublée, des tables, un parasol et un gril à gaz. Vous pourrez également profiter de toutes les commodités du club Currituck, qui comprend tout le nécessaire pour des vacances en famille actives et sûres: terrains de basket-ball, putting green et centre de remise en forme, ainsi qu’un chariot qui vous transportera avec votre équipement de plage. propose un service de voiturier, un bain complet et un snack-bar, le Trolley Stop. La piscine privée est ouverte de mi-mai à mi-octobre. Beautiful home, very spacious rooms and tastefully decorated. Absolutely loved the pool. The hot tub was a little disappointing, had only one jet that worked. Screened back porch was nice for watching pool activity and also to sit out on at night & relax. The outside lights above "garage door" on corner and on each side did not work, so wasn't light for driveway area at night when going to or coming from cars or taking out garbage. Plenty of space for parking in driveway. Liked that Trolley picked us up at end of driveway to go to beach. Very nice community. Overall was very pleased with this rental house. Our Family had a great time!! The house is amazing, the beach was crowded and water was cold! First things first: the house is a gem. It gets 5 stars. Clean, spacious, well-stocked, and many wonderful surprising spaces. The pool is far bigger than it looks on the pictures. The back covered porch overlooks it and was a wonderful place for grandparents and children meals and conversations. The club provided good opportunities for us to play basketball and volleyball. The beach was packed with people. It gets 2-3 stars. And the water hovered between 71-76 degrees. If that works for you, good. For me, anything under 75F in a beach is freezing. Waves were strong but the lifeguard was always present and provided great details about riptides and H2O conditions. Great layout for socializing. Nice pool/hot tub. Screened in porch was nice to keep an eye on the kids while swimming. Bedrooms more than accommodated our party of ten with a mix of two sets of parents, grandmother, teens and small kids. We felt we could have fit another family with us. Place was clean and well organized. Beautiful hardwood floors on main living area. The gated community was also a plus. The trolley was just as convenient as driving to the beach. Close to restaurants and shopping. Our only bad experience was with the pool guy. Showed up after we checked in and made everyone wait to get into the pool. Was rude both times we had to deal with him. Overall, I would highly recommend this place. We had a great week. Download the app for the rental. Really makes life easy. So happy to hear you enjoyed staying at Serendipity for the week and that you also enjoyed the Currituck Club and their facilities. Sorry to hear you had a bad experience with the pool vendor; we will follow-up on that. Otherwise, thank you for giving Paramount Destinations and future guests great information on your time here with us in Corolla and we look forward to seeing you again in 2018! We loved the home. It was in need of deep cleaning, however. It was too far from the ocean. Won't go back. Thank you for your review on your recent vacation at Serendipity. Sorry to hear that you were disappointed with the home and its location. We have many homes to chose from, so we hope you do return to vacation with us again in 2018. If we can assist you in any way, please do not hesitate to reach out. Perfect in every way. Exceeded our expectations! Very clean and beautiful home. Location, accommodations and amenities were exactly what we were looking for. Already talking about returning to the OBX. 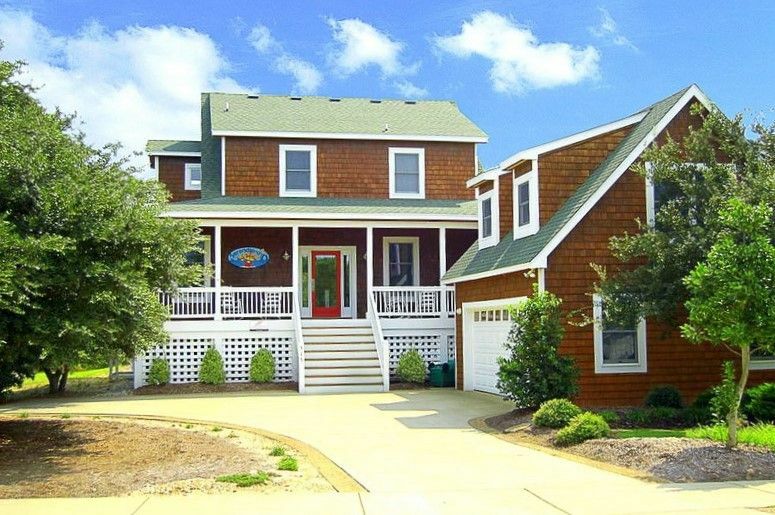 We would definitely stay at Currituck Club again.